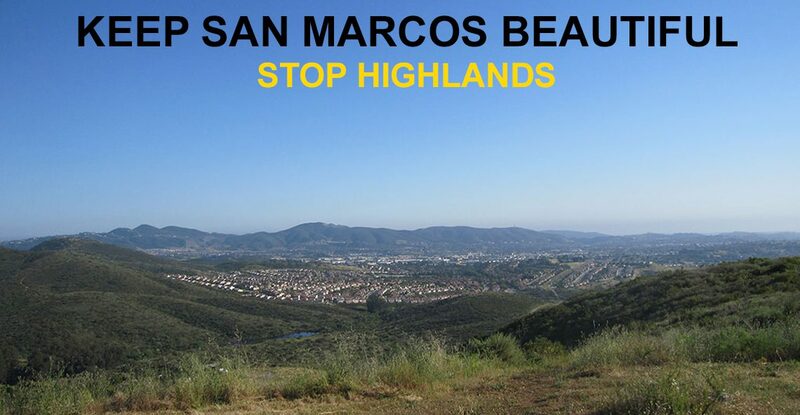 San Marcos Highlands is a reckless over-development project that paves the way for the Las Posas extension, more traffic and future high-density developments. The San Marcos Highlands development (~200 homes on the open space & Ridgelines north of Las Posas) is up for a City Council vote on Tue, Nov 15, 6:00 PM. Parking: Park in the parking garage. Parking is free. Dear San Marcos City Council — This letter is to advise you that I am opposed to the San Marcos Highlands development. This proposed development unfairly burdens San Marcos qualify of life by ignoring the spirit and intent of the Ridgeline Protection Zone ordinance. The development adds too many new homes to an already congested area in terms of traffic, limited park space and overcrowded schools.Please vote NO to this destructive project. You don’t have to speak at the City Council hearing. Your simple presence will send a message. If you would like to speak, watch this helpful video. We are not against growth, we are for smart growth that protects what makes our lives and community so special and unique. If development does happen on this land, it must preserve or enhance our quality of life, limit development on our iconic ridgelines, not overcrowd our schools and not add ridiculous amounts of traffic on Las Posas. For as much as the Highlands project takes away from San Marcos and our quality of life, it should do twice as much to give back. The San Marcos Highlands project DOES NOT technically extend Las Posas all the way to Buena Creek Rd, however, the Highlands project does extend Las Posas roughly 1/3 the way to Buena Creek Rd. The Highlands project also pays into a CFD that funds up to $5 Million Dollars towards the future extension. Other words, the Highlands project is the KEY for the City to extend Las Posas all the way to Buena Creek Rd and one reason that certain City Council members are biased towards approving the Highlands. Please watch this short video to better understand the City’s unfair bias towards the Highlands project and Las Posas. 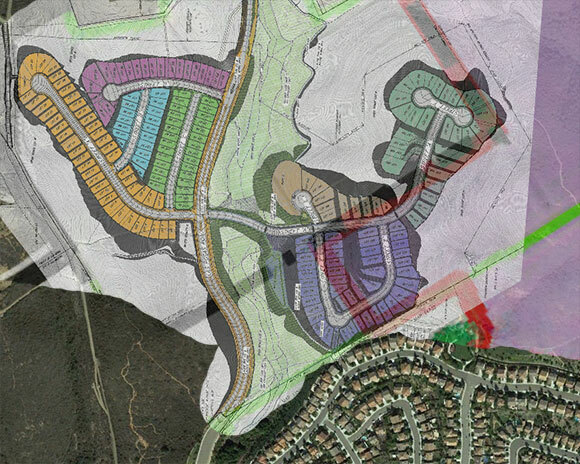 The Highlands Development proposes 37 homes on top of a ridgeline that falls within the San Marcos Ridgeline Protection Zone. (The Ridgeline ordinance was voted into law by the people in 2008 in order to preserve San Marcos ridgelines from development). The drawings of new homes and streets in the photo below are of the Highlands project. The shaded area in pink is the Ridgeline Protection Zone. Notice the overlap. The San Marcos Highlands development has been proposed several times in the past, and opposed every time. The project was never a good idea, especially in today’s conditions. Learn more about the Highlands history here.